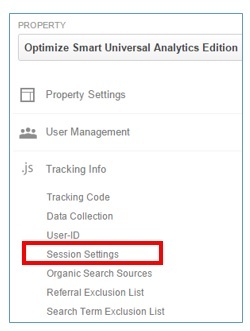 How does Google Analytics define a session? When does a Google Analytics session expire? How can a Google Analytics session last longer than 30 minutes? In Google Analytics, a session is a group of hits recorded for a user in a given time period. A user can generate one or more sessions. All Google Analytics sessions have got expiry date. They can’t last longer than 4 hours. A web session is a series of HTTP requests and HTTP responses exchanged between a web browser and a web server in a given time period. Whereas, a Google Analytics session is a group of hits recorded for a user in a given time period. So web session and google analytics session are not the same thing. It is important that you understand this difference. In this way when you talk to your developer, he doesn’t get confused. For a web developer, a session most likely means a web session. So if you are referring to Google Analytics session then you need to explain the difference between a web session and a google analytics session to your developer. A GA session expires, if no new hit is sent to GA server within 30 minutes from the time when the last hit was sent. In layman language we call this period of no new hit sent as ‘no user’s activity’ on a website. For example, if a user is browsing your website since 11:45 pm, his session will automatically terminate at 11:59:59 pm even if he continue to engage with your website. At 12 am a new GA session will start for your user. A GA session can also expire if a user return to your website via a different campaign source. The campaign source could be: search engines, referring websites, URLs with campaign parameters. It doesn’t matter whether the user returns within 30 minutes or after 30 minutes, every time a campaign source is changed, the existing session expires and a new GA session starts. If a user visit your website via organic search listing the first time but later (say after 15 minutes) return to your website via paid search ad then the return visit will end the existing GA session and trigger a new GA session, as the campaign source has changed. If a user visit your website via paid search ad the first time but later (say after 15 minutes) return to your website, by again clicking on the same paid search ad and Google Adwords autotagging is enabled then the return visit will end the existing GA session and trigger a new GA session as the campaign source has changed. Here the campaign source changed because GCLID value changed. In case of Google Adwords autotagging, each ad click has its own GCLID value. So multiple clicks on an ad can generate multiple GA sessions. If a user visit your website via paid search ad the first time but later (say after 15 minutes) return to your website, by again clicking on the same paid search ad and you are using manual tagging instead of Google Adwords autotagging then the return visit will not end the existing GA session and not trigger a new GA session as the campaign source has not changed. Here the campaign source did not change because the campaign tracking parameters did not change with each click on the ad. So if you are manually tagging your adwords campaigns then multiple clicks on a same ad by a same user will not generate multiple GA sessions. If a user visit your website via organic search listing the first time but later (say after 15 minutes) return to your website directly then the return visit will not end the existing GA session and not trigger a new GA session, as direct traffic does not override the campaign source. If a user visit your website via organic search listing the first time but later return to your website directly, after 30 minutes have elapsed then the return visit will end the existing GA session and trigger a new GA session. This happened because, by default GA session expires after 30 minutes of users’ inactivity. A GA session does not expire if a user navigate to another website but return to your website within 30 minutes. Every time a new hit is sent in a GA session, Google Analytics reset the expiration date of the session by adding another 30 minutes from the time when the last hit was sent. In this way a session can last longer than 30 minutes. By default a session expires after 30 minutes of users’ inactivity. 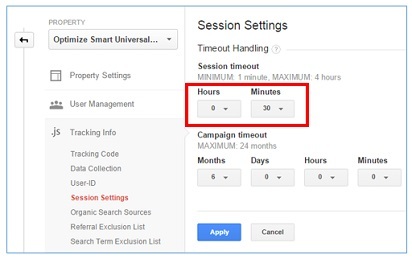 You can change this setting by changing the session timeout settings in your GA view. A GA session timeout can not be less than 1 minute or greater than 4 hours. The length of GA session you decide to choose, depends upon, how much time a user spent on an average on your website. If for some reason an average user has to spend lot of time on your website (say 3 hours on an average) to engage with your website content or complete some task (file an application, play a game etc) then you should set the session timeout to match the length of the time spent. You can use average time spent on your website to decide the length of your GA sessions. So for example, if average time spent is 3 minutes, you can set the session timeout setting to 3 minutes instead of 30 minutes. There may be situations where you want to force a GA session to start and end depending upon user’s activities. You can do that by using the sessionControl configuration parameter while sending a hit. The value of ‘start’ forces a new session to start with a specified hit. The value of ‘end’ forces a current session to end with a specified hit. You can learn more about this issue from this article: Why Google Analytics Show Zero Sessions?